Primary Embossing = Embossing on the front of the insulator, usually is that manufacturers name or the customers name. No embossing units will be noted as NO EMBOSSING. Units with no name but with numbers or letters will be noted as NO NAME. EIN = Embossing Index Number is a standardized way to identify each unique embossing. 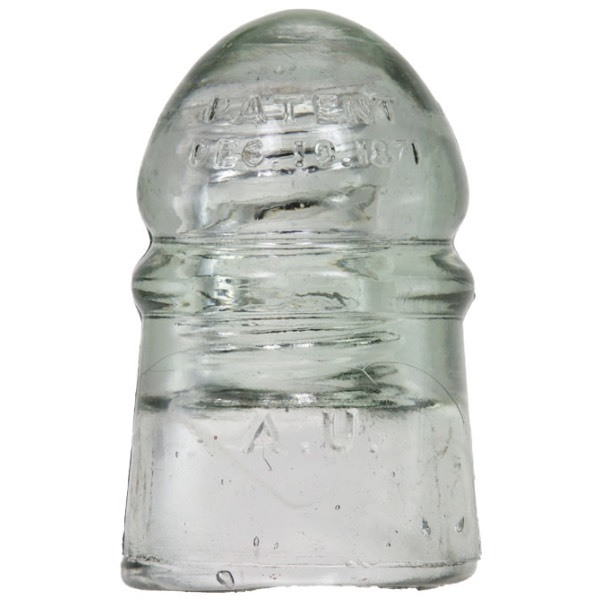 There are unique characteristics of the insulator that are not related to the embossing, but is worth noting. Base = the bottom of the insulator. It is noted in the following standardized ways. = Insulator has been verified that exists, but not listed in the "guide"
= Suspected error listing in the "guide" because listing does not match up with known manufacturing practices. Such as numbers and dots on an aqua insulator, or insulators listed with both factory molded brass bushing and without. Many do not come in both configurations and are listed as coming in both. Etc. Color = The approximate color of the insulator. Due to manufacturing variations, insulators with the same color name maybe slightly different in actual appearance. Primary Embossing EIN Embossing Special Features Base Color Verified? (FC) PATENT/DEC. 19. 1871 (FS) A.U.